Squinting into the sun, I squeeze my eyes together tight like a clam. I'm gently skipping my hot feet across the sun fried sand. I can sense the deep blue sky and frothing dark water, contrasted by the grinding beach of lobster dreams. I feel steel drums come in and out of earshot, or maybe an acoustic guitar? Regardless, an already perfect day, now has a soundtrack. I drift in a ocean water haze, vainly following the sound intermittently coming in and out of focus on the breeze. The music tickles my eardrum on each passing gust. I decide to follow the music like a peasant behind a piper. Feeling I have nothing better to do today, I walk on, enjoying the day and my unknown jester. My steamy stumbling beach walk takes me to a place containing a perfume air, and a fitting music. I now can clearly hear drums, and a fitting metallic chime of chunky acoustic guitar. A five foot stucco retaining wall corrals the music behind its garden gate. A voice now joins the mini orchestra, instantly familiar, but singing an unknown song. It sounds just like John Lennon." Wow, what happened to him? ", I think to myself." It's been a few years without as much as a peep"." Can you imagine? ", "Ha ha ha, Imagine, good one dude", I chuckle. I approach the mystery music on silent sand footsteps. A ornately decorated villa frames the larger scene, where the coastline caresses the front of a breathtaking colonial building. A glass walled sun room jettisons from the rest of the home,where I glimpse a silhouette behind pained glass.This human shape appears to have headphone ears, a long pony tale, and a nose like a Bermuda bird. The heady scent of Freesia fills my nostrils intoxicating me, and makes me feel a bit euphoric. I can't be sure what I see. I assume this is the source of the mysterious beach serenade. The soothing music has to be emanating from this sunshine shadow. I step cautiously toward the wall, careful to not set off a alarm mutt, or security. "Hey! ", "You looking for my Dad? ", a young boy about five years old screams at me as he flies by like a beach Frisbee. Startled, I am unable to speak in time as the boy motors toward the front of the villa. My nervous stomach slightly recovers, "I think its about time I travel on", I say to myself out loud, feeling slightly like an intruder. ADDENDUM: This fiction was created through dreams based on reality. 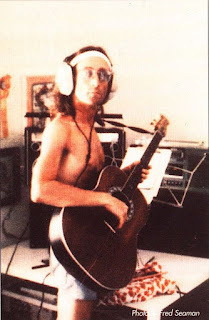 The Summer of 1980 was John Lennon's last, and he was busy creating his Swan Song "Double Fantasy" while vacationing in Bermuda. John had disappeared from the public eye for five years, and was ready for his return to the music world after this period of intense creativity. 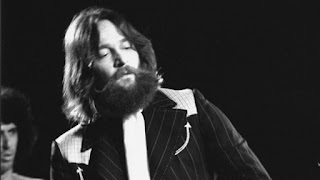 The "Bermuda Demos" John created during this fertile period are some of the greatest music he wrote. By December he would be living his last days.